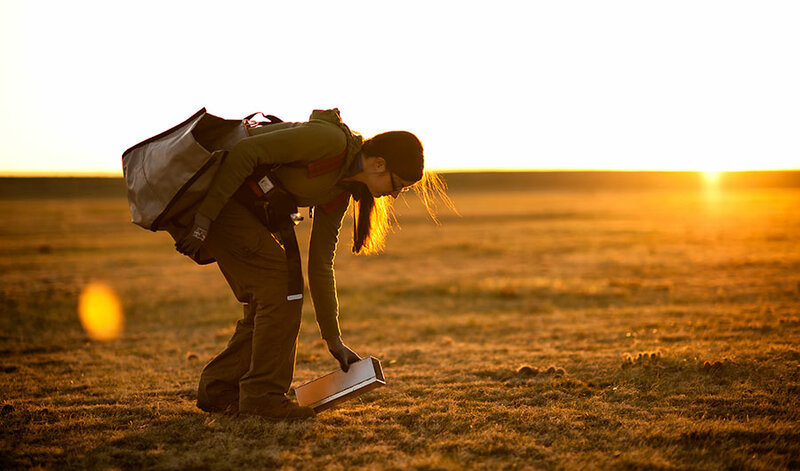 A NEON staff scientist checks a small mammal trap at the Central Plains Experimental Range, Colorado in May 2014. This image may only be reproduced with this Inside Science article. (Inside Science) -- When I visited one of the National Science Foundation's new ecological observatories near Front Royal, Virginia, three months ago, there was a palpable hum of triumph and optimism. I followed my guides through tidy laboratories where ecologists sorted leaf litter, past the PVC pipe tops of instruments buried in forest soil, and beneath the looming bulk of an air sampling tower, my neck craning to see metal scaffolding stark above the treetops. Staff members spoke with pride of the data pouring in, and of matching data sets from dozens of other observatories operating across the country. These sites are all part of the National Ecological Observatory Network, known as NEON, which aims to offer a big-picture view of changes in environments and ecosystems. Data from the project could help answer countless questions, from how rodent species evolve to whether emission reduction targets are enough to avert catastrophic climate change. Now, the nearly decadelong construction phase is almost complete, with an estimated price tag of $469 million. But as 2019 began, so did a barrage of disagreements and departures among NEON leadership that has shaken the project just as it is slated to begin a 30-year run of data gathering. The upheaval is the latest in the project's long and troubled history -- a history many thought had finally been laid to rest. Now, the new troubles once more raise the question: Can NEON deliver on its promise? Most ecology projects are conducted by one or a few scientists over two to five years. This limited scope makes it hard for researchers to assess environmental change playing out across decades and continents. Enter NEON: a data-gathering machine that operates at the same grand scale as the processes it tracks. NEON was designed around the first six "grand challenges in environmental sciences" identified in a 2001 report by the National Research Council, which include improving understanding of climate variability, the ecology of infectious diseases, and how chemicals cycle through the environment. The network's 81 observatories are spread across 20 "domains" representing distinct climatic and ecological conditions in the continental U.S., Alaska, Hawaii and Puerto Rico. The data are being made available online, free for use by farmers, educators and community members as well as researchers. 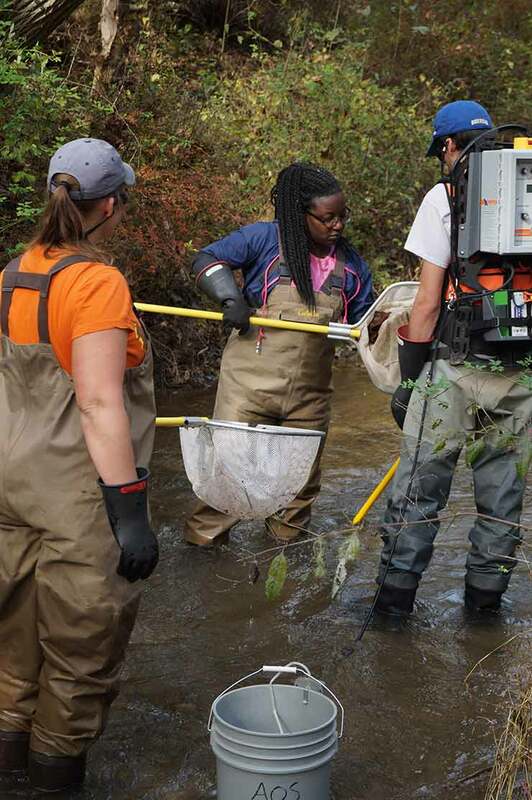 Field ecologists catch fish using an electric current at a Virginia NEON site in 2018. The electricity temporarily stuns fish, allowing them to be measured and then released unharmed. Rights: This image may only be reproduced with this Inside Science article. "The special thing about NEON is that the data are collected in the exact same way everywhere at all the NEON sites. That really reduces the bias that we might get from data that was collected from a variety of different investigators, with a variety of different methods," said Phoebe Zarnetske, an ecologist at Michigan State University in East Lansing, who is using NEON data in her research. The NSF began developing the project in collaboration with the scientific community about 20 years ago. It gave control of the project to NEON Inc., a private nonprofit organization developed specifically for the purpose. But by 2015, the company was behind schedule and projecting cost overruns of $80 million. An independent review conducted by retired U.S. Air Force Gen. James Abrahamson concluded that NEON Inc. lacked the leadership and experience to pull the project off. At the same time, scientists were complaining that their advice was being ignored. Many felt the project was moving forward without guidance or buy-in from the community that would eventually use the data. Everyone I spoke with, including representatives of NSF and the former and current contractors hired to oversee the project, agreed that the scientists' complaints were valid, though they disagreed about whether NEON Inc. or the NSF was to blame. "[Neon Inc.] would have all kinds of workshops, people would give all kinds of input, and then they'd ignore it all," said Mike Binford, a University of Florida landscape ecologist who has been involved with NEON since 2001. Binford is currently serving a two-year rotation as an NSF program director helping oversee NEON funding. In 2015, the NSF reduced the scale of NEON in an effort to bring it back within budget, canceling 14 sites and some of its more challenging experimental components. A few months later, the NSF ended the contract with NEON Inc. and hired an established company called Battelle to rescue the project. Battelle is a large nonprofit corporation with a track record of managing major federal research facilities such as Oak Ridge and Lawrence Livermore national laboratories. Under Battelle's leadership, NEON has advanced mostly according to plan, except when it ran into uncontrollable factors such as the Kilauea eruption in Hawaii, according to Ivy Kupec, a public affairs specialist with the NSF. Kupec added that Battelle has met construction milestones and cost projections, and it received positive evaluations from external site reviewers who assessed the project's progress in July 2018. When I visited the Virginia site on Oct. 31, all but one of the sites were complete, and the NEON team was celebrating the transition from construction to full operation. "We had a lot of disappointments along the way," said Binford. "But in the end, I'm as excited as I can be." A NEON field ecologist collects a soil sample at a site near Front Royal, Virginia in Oct. 2018. 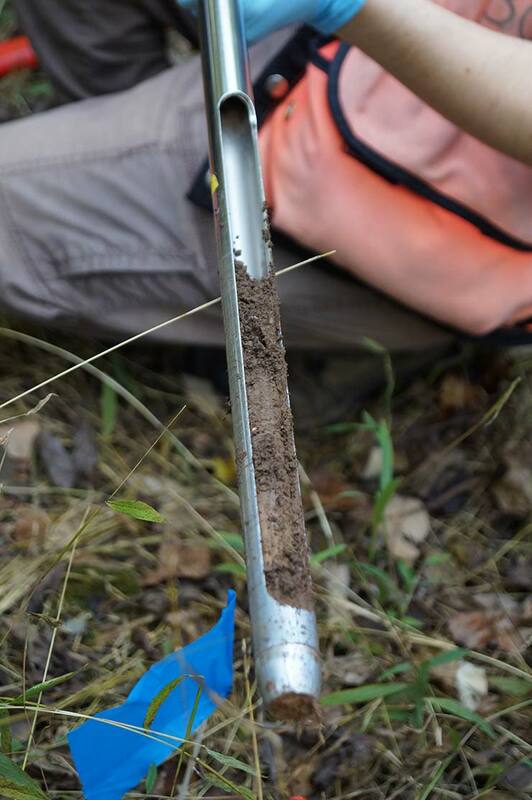 During my site visit, I watched a pair of Battelle's NEON field ecologists pound an open-sided pipe into the ground with a sledgehammer, then lift out the soil, measure its layers and divide it into vials. "I've worked on projects where I thought it would be amazing to have the kind of data that we are collecting," said Lorien Lemmon, the one with the sledgehammer. "I was really attracted to the fact that we are contributing to something that will keep going." The soil was destined for NEON headquarters in Boulder, Colorado, where other Battelle scientists would use DNA analyses to identify the microbes living in it. While some soil samples are analyzed immediately, others are stored in frozen repositories, and any scientist can apply to use them in their own research, said Lee Stanish, NEON's lead microbial ecologist. Soil samples like the ones Lemmon collected provide roughly nine of the more than 170 different types of data produced by NEON, and scientists from a wide range of institutions are making use of these growing data sets as fast as they appear. For example, Michigan State University's Zarnetske has used NEON data to learn about the diversity of rodent species in different climates. Zarnetske and her colleagues used measurements from rodents trapped at 26 NEON sites in 2015. She found that in cold places such as Wisconsin, species tended to overlap in body size, indicating that they shared ecological niches. In warmer places such as New Mexico, each species had a narrower range of sizes that didn't overlap much with the size ranges of other species. The findings, published in January 2018 in the journal Ecography, add weight to a long-standing theory for why warm climates are so diverse. The idea is that cold regions have fewer species because their denizens must be generalists, able to rely on many different types of resources to survive the harsh conditions. In warmer climates, the primary challenge is competition for resources, so animals might occupy narrow niches that don't overlap with those of other species -- becoming the best at eating one particular size of seed, for example. Groups of species with narrow, nonoverlapping niches would be expected to have narrow, nonoverlapping body sizes as well, just as the rodents did in Zarnetske's study. Her team is now conducting similar research with NEON bird and plant data. 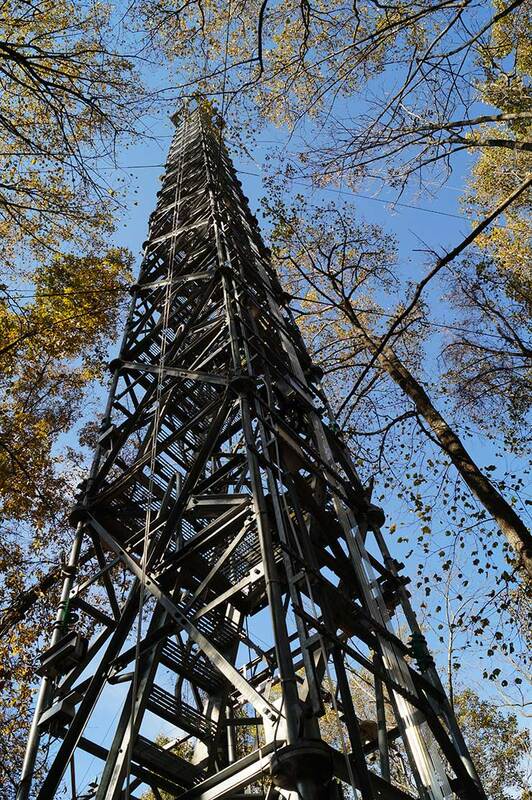 An instrument tower takes air samples from many different heights at a NEON site near Front Royal, Virginia in Oct. 2018. NEON is still in its infancy, its data just starting to yield small-scale findings. But the ultimate promise of the project is its ability to answer fundamental questions too big for any one time or place. For example, Ankur Desai, a climate scientist at the University of Wisconsin-Madison and a member of NEON's science advisory committee, is using NEON data and resources to model what he calls "the breathing of the biosphere." Living things such as plants and soil microbes both absorb and release carbon dioxide. Scientists don't yet have enough data to model this carbon cycle accurately, said Desai. But the NEON project could change that, providing comprehensive, long-term data sets about plant growth and carbon dioxide levels across many sites. Carbon cycle models like the ones Desai builds are important because they are part of the larger models that predict Earth's future climate. Currently, the greatest source of uncertainty in climate models is how much carbon humans will emit, said Desai. But the second-greatest source of uncertainty is how carbon is absorbed and released by living things. "It's a big problem," he said. "Some of the models, like, become a Garden of Eden, and take up massive amounts of carbon, and other models turn the ecosystem into Mad Max and there's fires and droughts everywhere." When Battelle took over the troubled NEON project in 2016, it immediately set about repairing relationships with outside scientists. Battelle staff convened workshops, presented at scientific meetings, overhauled the science advisory committee, and established technical working groups. By fall 2018, the scientific community was back on board, and many scientists I interviewed expressed eagerness to work with NEON data as the project came fully online. Then on the morning of Jan. 4, 2019, Battelle fired two high-level NEON staffers, Wendy Gram and Richard Leonard. Gram in particular had earned the trust of the scientific community, leading many of Battelle's outreach efforts to scientists. According to Travis Huxman, an ecologist at the University of California, Irvine and chair of NEON's science advisory committee, she "was one of the people who seemed to be a driving force for the good direction that NEON was headed." News of the firings came as a shock to Sharon Collinge, who had worked closely with Gram since coming on board the previous spring as NEON's new director and chief scientist. On Jan. 8, Collinge resigned in protest. During her brief tenure as NEON director, Collinge had retained her affiliation at the University of Colorado Boulder, making her a subcontractor rather than a regular Battelle employee. That meant she could not have direct control over financial or personnel decisions -- but she still expected to be included in the conversations. Huxman said the committee members were blindsided by the firings and dismayed by the way their colleagues at Battelle had been treated. They were discussing how to respond when they received an email from Battelle chief scientist Mike Kuhlman dissolving their committee. Committee members including Huxman and Desai quickly shared their grievances through Twitter and the media, and the story spread. "I was in the process of writing a proposal to use @NEON_sci field sites, but why would I support their science when they treat their key, prominent scientists like this?!" tweeted Celia Faiola, an assistant professor at the University of California, Irvine. For Desai, Battelle's actions felt like a betrayal. Only last year he had been so enthusiastic about NEON that he participated in a promotional video. When he heard about the dissolution of the advisory committee on which he sat, Desai tweeted, "@NEON_sci How dare you! Why should I support you anymore?" On Jan. 14, the disbanded committee members released a letter asking Battelle to reinstate them. Three days later, Kuhlman offered a personal apology and reinstated the committee. "That's really good news, because it means that we've preserved a voice for the ecological community in decision-making and advice for NEON," said Huxman. All this happened during the partial government shutdown, so the NSF was largely unable to respond at the time. But according to Amanda Greenwell, director of the NSF’s Office of Legislative and Public Affairs, the NSF supports the reinstatement of the NEON science advisory board. Like the rest of the committee members, Desai agreed to return when Battelle changed course. For now, he supports the project and is confident that its data are sound, though he harbors new doubts about its leadership. Desai's faith in the NEON data is based on his faith in its staff scientists, whom he said are highly skilled. Desai's main fear is that if leadership problems continue, Battelle might have trouble recruiting and retaining top talent -- and then outside scientists might not trust the data enough to use it. Zarnetske, too, still believes in NEON's data and mission, though she found Battelle's recent actions concerning. She fears the turmoil will overshadow NEON's scientific achievements. "I think the important thing is for people to separate out the 'management' aspect of Battelle from the great science that is being made possible by NEON," she wrote in an email. "It is really important that we not abandon NEON, as it is providing so many opportunities to monitor, understand, and forecast ecology at a continental scale." After three months reporting on NEON, I am more confused than ever about what the future holds for it. In some lights, it looks like the future of ecology; in others, it seems more like ecology's Icarus, doomed because it aimed too high. Advisory committee chair Travis Huxman describes NEON as a make-or-break project for ecology, with the entire field poised on the cusp of a great advance. If it fails, he fears ecologists may not get another chance, because funding agencies won't want to repeat an expensive mistake. To explain the significance of NEON, Huxman points to other fields where scientists are already using detailed models to predict things like weather or the height of waves on California beaches. With NEON data, ecologists may be able to do the same with carbon cycles and other processes that involve the living world. "Ecology's really close to that place. And this is our opportunity," said Huxman. "This is the moment."